Lopamudra was the wife of Sage Agastya and her story is mentioned in the Mahabharata and the Rig Veda. She was the daughter of King of Vidarbha. Legend has it that the king of Vidarbha did not have children. 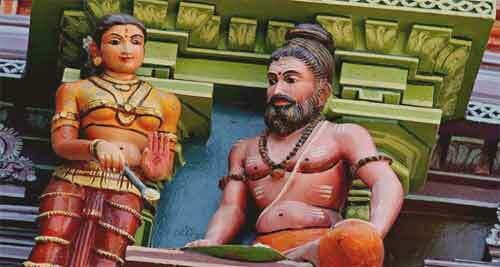 He was once doing penance for a child and Sage Agastya reached the spot. Sage Agastya using his powers created a girl of great beauty. The girl was given to King of Vidarbha and she was named Lopamudra. Sage Agastya had never thought about marriage but once he happened to see his deceased ancestors suffering as they could not enter heaven. The ancestors of Sage Agastya were denied heaven as he was not married and he did not have any children. Shradh and Tarpan performed by those living on earth helps in the dead ancestors achieve liberation. Sage Agastya was short in stature and lived in the forest. So no girl was ready to marry him. This is when the sage happened to hear about the penance of King of Vidarbha. When Lopamudra became a maiden, Sage Agastya approached the king and expressed his wish to marry her. The king hesitated but Lopamudra consented to be the wife of the Sage. There is also a belief in some regions that Lopamudra is the human form of River Cauvery. In some temples in Tamilnadu especially those located on the banks of Kaveri River, Sage Agastya and Lopamudra are worshipped together as subsidiary deities.